Salvatore Ferragamo is an Italian fashion brand which produces high-end shoes, handbags, small leather goods, jewellery, and other accessories. The brand, which is most known for their elegant shoe selection, has products available for men, women, and girls. With Big Apple Buddy’s personal shopping service, you can now buy direct from the USA Salvatore Ferragamo online store anytime, anywhere. At Salvatore Ferragamo, you can search for shoes for both formal and more casual occasions. The Lace Detail Pump is a classic pointy toe pump featuring subtle lace detail which are perfect for a night out or a special occasion. Made of calfskin, this shoe has a 7 cm heel--just enough to give you that extra boost without being too painful to walk around in all night long. These heels are classic enough to be able to wear on multiple different occasions, but you can be sure that you’ll always make a statement whenever you step out in them! They are also available in a more neutral black color or a bright blue, so choose which best fits your wardrobe! 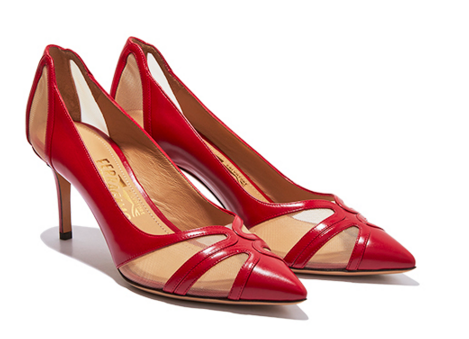 There are other more casual shoe options available at the USA Salvatore Ferragamo online store, and they’re equally stunning! The Lasercut Espadrille Sandal features criss-cross straps and lasercut detail that will make it stand out from any other shoe in your closet. Also made of calfskin, these sandals are a great addition to your wardrobe for the summertime-- they will instantly make any flowy summer dress look more formal and stylish! They are shown here in a black color, but also come in a neutral brown tone. There are plenty of shoe options for men at Salvatore Ferragamo as well. 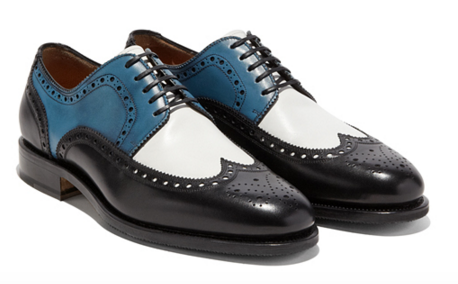 The Wingtip Derby Spectator is made of calfskin on a half rubber sole and is a great option if you’re looking for a formal yet funky shoe. The mix of black, white, and blue make this shoe stand out from most others but is neutral enough to match with most of your wardrobe. If you’re looking for a formal and elegant shoe that is different from all the other ones in your collection, look no further than these wingtips! Unfortunately, the USA Salvatore Ferragamo online store does not currently offer international shipping. However, Big Apple Buddy, your personal shopper, can help you buy products direct from the official USA Salvatore Ferragamo online store and ship them to your doorstep, no matter where you are in the world. We offer international shipping to over 190 countries including Australia, Austria, Bahrain, Belgium, Bosnia & Herzegovnia, Brazil, Brunei, Canada, China, Croatia, Cyprus, Denmark, Estonia, Finland, France, Germany, Hong Kong, Hungary, India, Indonesia, Ireland, Israel, Italy, Japan, Kenya, Kuwait, Lithuania, Macau, Malaysia, Maldives, Mexico, Namibia, Netherlands, New Zealand, Norway, Oman, Pakistan, Philippines, Portugal, Saudi Arabia, Scotland, Serbia, Singapore, Slovenia, South Africa, South Korea, Spain, Sri Lanka, Sweden, Switzerland, Taiwan, Tanzania, Thailand, UAE, UK and Ukraine. If you would like to buy from the USA Salvatore Ferragamo online store, simply let us know which items you would like to order (by filling out the form on the right) and we’ll get back to you with a free international shipping quote within 24 hours!